As cooler winter weather begins to take a backseat to balmy spring-like conditions, more and more Texas homeowners will be turning their attention to their garden at this time of year. Whether you’re looking to give your outdoor living space a complete overhaul or are trying to lighten your maintenance load this year, we have some great low maintenance planter ideas to keep in mind. These ideas that can work with any number of backyard garden ideas. For homeowners who want to add some texture to their outdoor living spaces and planters, ornamental grasses are an attractive low maintenance option. These plants only need to be trimmed and cut once in the spring and require very little water. Plant two or three varieties in the same box to create a stunning visual display. Requiring more care than the above plants, topiaries are a great way to add some height and diversity to your garden. 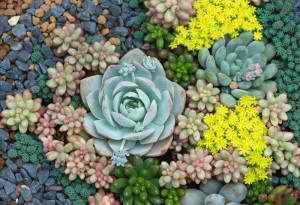 Best of all, these plants can be dressed up for any occasion, from winding string lights around them to planting perennials around their base to inject bursts of color to your garden. Keeping each plant in a separate planter is one way to create an easy to maintain backyard living space. Situate these planters together in groups or affix them to a garden wall if you’re short on space. For those looking to create a garden that’s easy to maintain and sustain, xeriscaping may be something to consider. This new form of landscaping increases water efficiency, allowing homeowners to conserve water without having to sacrifice the appearance of their outdoor living spaces.